HIROSHIMA, Japan—Mazda Motor Corporation has released the Mazda Roadster BLACK TUNED, a special edition version of its iconic lightweight, two-seat, open-top sports car for the Japanese market. The special edition Roadster (known overseas as the Mazda MX-5) goes on sale today at all Mazda and Mazda Anfini dealerships nationwide. 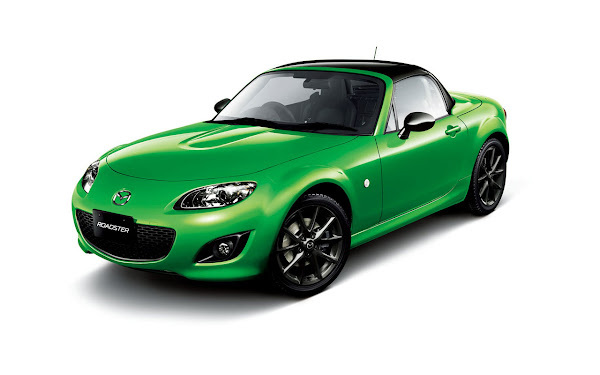 The Mazda Roadster originally launched in 1989 and is currently sold in approximately 60 countries around the world. Total production stands at over 900,000 units and the Roadster is officially certified by Guinness World Records as the world's "Best selling two-seater sports car". The special edition BLACK TUNED Roadster is based on the premium 'RS RHT' and 'VS RHT' model grades that feature Mazda's groundbreaking power retractable hard top (RHT). The BLACK TUNED theme is reflected in stylish special features including a Brilliant Black roof and door mirrors, and Gun Metallic 17-inch alloy wheels. Interior quality is also enhanced, with the seats and steering wheel covered in black leather with sand-colored stitching. Three external body colors are available, including two exclusive colors – Spirited Green Metallic and Velocity Red Mica – and the popular Crystal White Pearl Mica. Mazda Roadster RS RHT with 2.0-liter DOHC engine and six-speed manual transmission, and Mazda Roadster VS RHT with 2.0-liter DOHC engine and six-speed electronically-controlled automatic transmission. There is a choice of three exterior body colors: Spirited Green Metallic (exclusive), Velocity Red Mica (exclusive) and Crystal Pearl White Mica (special body color).